This past week, I was driving to Dallas for a meeting. I took a wrong exit and was paused at a stop light, when I noticed a homeless man walking his way down the street, flashing his sign at anyone who would look his way and read it. "I'm homeless and hungry. Anything will help." Straight and to the point. For some reason, this time more than others, I was legitimately concerned for him. I immediately started scrambling for any cash I had. I was two lanes over, so I second guessed even trying, but my heart was tugging. I thought of people saying to me in the past, "He'll probably only buy booze and cigarettes. Why doesn't he just get a job? 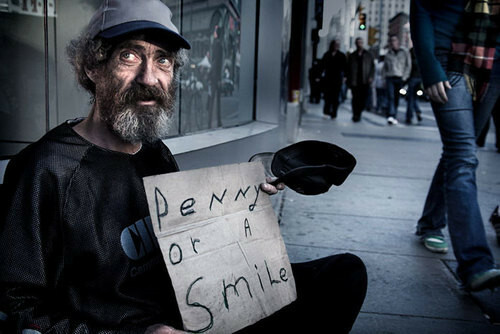 I bet he's not even homeless." How many times have we heard these cop-outs to serve someone in need? Honestly, I didn't even really care if he would buy beer. Since when did it become our place to judge that? Anyways, I had just made a deposit with any cash I did have and I didn't have enough change to make it worthwhile to give to him. Let's be honest, even gum costs more than a dollar these days. "Hey, do you need some water???" "Hey. Jesus loves you. No matter what, OK?" "Oh, I know it. I know, ma'am." I teared up as I drove away just thinking about how often I throw myself a pity party when I can't get a new pair of boots, when I have to return a sweater at Anthropologie, when we can't stop by Starbucks every day, or when we have to trust in the Lord to provide for us as we take a huge leap of faith. Despite this guys' circumstances...despite his homelessness, his past mistakes, his hunger, his thirst, his lack of basic needs, he knows in his heart that his Savior loves him. His life is rough, his body is letting him down, and yet he still proclaims that Jesus loves him and he knows it. I was so challenged by his faith, his realization that God hasn't let him go, and his smile as He told me that he knew Jesus loved him. Know that our King is for you, friends. Know that He is good and that He wants the best for us. Know that He never ever lets go of His children. "And if you give yourself to the hungry, and satisfy the desire of the afflicted, then your light will rise in darkness, and your gloom will become like midday. And the LORD will continually guide you, and satisfy your desire in scorched places, and give strength to your bones; and you will be like a watered garden, and like a spring of water whose waters do not fail." This is such a touching post! Thank you for sharing! I, too, give to the homeless...most of the time an extra bottle of water that's in my car too! :) I feel the same way...it's not for me to judge and I have so much extra compared to their situation...regardless of what brought them there. i got goosebumps reading this, friend. thanks for sharing. p.s. have you ever heard of that song by matthew west called "my own little world"? i thought of it as i read your post. you might like it too if you haven't listened to it before. youtube it. beautiful, beautiful, beautiful. this had my eyes welling with tears. you are so articulate in your reflections. it's time for me to spend some time with Jesus. p.s. you're in Texas now, not Colorado? what kind of job are you working? i'm so out of the loop! beautiful + inspiring. Thanks for sharing. Oh girl, I know this feeling so well! When I lived on campus I always used to go to a certain art store in my spare time to get supplies for school, and everyday rain or shine there was a man on the street corner where there was a bumper to bumper traffic light. He always had a sign saying he was a homeless war vet and was hungry. Everytime I saw him I felt horrible. No one did anything. And we were all sitting in our cars avoiding eye contact hoping the red light would hurry so his sad eyes wouldn't make us do something nice. horrible, I know. Well one day I saw him in the cold and I was all torn up. I went to the store and bought some granola bars and drove over to him, waited in the red light and rolled down my window. He looked at me not sure if I was just getting air so I waved him over and he came jogging over putting his sign down. I handed him the box of granola bars and he looked shocked. Probably expecting a quarter or a business card. I smiled and he thanked me over and over before traffic started moving. I was so shaken up by his gratitude and his shock of having someone display simple kindness towards him. I cried the entire way home. Thank you so much for sharing this, it was a beautiful post that brought me to tears. We often take for granted the simple things like a bottle of water, a good pair of shoes, a warm coat or even a soft place to sleep. There should be more people like you in this world, thank you! This beautiful post really brought me to tears...they are running down my face as I write this!! Thank you so much for sharing...you are truly awesome!! This post almost made me cry! 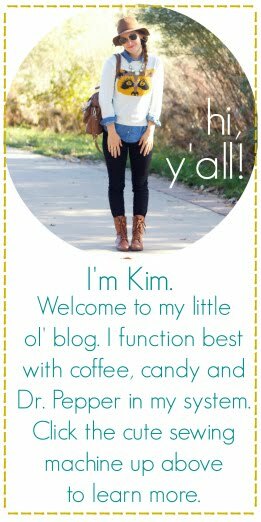 Kim, this is so inspiring and so beautifully written!! I know exactly what you mean about that awful little voice that questions what the person will do with the money. Everybody is connected and we are all God's children. No exceptions. Thank you for this post friend!!! Thanks for the post, Kim! Really beautiful and an important reminder for all of us. Your heart is beautiful. Thank you for sharing, you not only brought me to tears...you encouraged me to open my heart a little more. sweet story. i'm in huge support of giving needed and wanted items rather than cash to those in need. definitely something i could be challenged to do more. Thanks for your encouraging words. I just emailed it out to our small group. We live in the city and interact with suffering quite often. Your post was a great reminder of our call to love others and direct others to His love. i teared up too. such a simple story, with such a powerful message. we are called to love the least of these & so often we, meaning i, get caught up in the mumbo jumbo of life. so often i just drive by, afraid to look in those desperate eyes of the broken and needy. i look forward. pretend i don't see. shameful, but true. oh God, break my heart for what breaks yours. wow this seriously made me fight tears. what a beautiful post and proclamation of how good the Lord really is. This is my first visit to your blog and this post really moved me. I have often said myself that giving money to homeless people will just lead them to buy beer instead of beer, but you're right, who are we to judge. We have no idea what got them into that situation. Bless you for helping in the only way you could and for passing on Christ's love! this tugged at my heart.